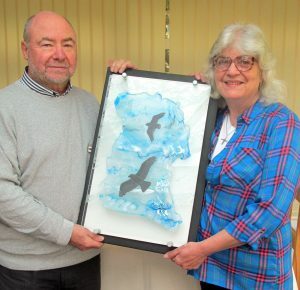 Many thanks to Bill Swann and Meic Watts for donating the glass wall hanging they made specially for Bywyd Gwyllt Glaslyn Wildlife Summer Raffle. Congratulations to winning ticket holder Margaret Dewsnap who was recently presented with her prize by Bill Swann. Thank you to all who bought tickets you raised £507 for the charity.